In Operation Speedy Express, new evidence of civilian slaughter and cover-up in Vietnam. 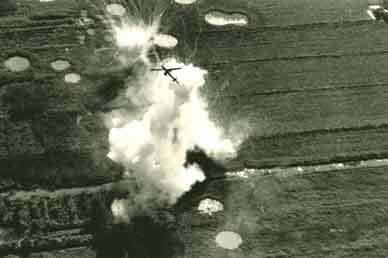 AP/MCINERNEY A helicopter gunship pulls out of an attack in the Mekong Delta during Speedy Express, January 1969. An inkling that something terrible had taken place in the Mekong Delta appeared in a most unlikely source–a formerly confidential September 1969 Senior Officer Debriefing Report by none other than the commander of the Ninth Division, then Maj. Gen. Julian Ewell, who came to be known inside the military as “the Butcher of the Delta” because of his single-minded fixation on body count. In the report, copies of which were sent to Westmoreland’s office and to other high-ranking officials, Ewell candidly noted that while the Ninth Division stressed the “discriminate and selective use of firepower,” in some areas of the Delta “where this emphasis wasn’t applied or wasn’t feasible, the countryside looked like the Verdun battlefields,” the site of a notoriously bloody World War I battle. That December, a document produced by the National Liberation Front sharpened the picture. It reported that between December 1, 1968, and April 1, 1969, primarily in the Delta provinces of Kien Hoa and Dinh Tuong, the “9th Division launched an ‘express raid'” and “mopped up many areas, slaughtering 3,000 people, mostly old folks, women and children, and destroying thousands of houses, hundreds of hectares of fields and orchards.” But like most NLF reports of civilian atrocities, this one was almost certainly dismissed as propaganda by US officials. A United Press International report that same month, in which US advisers charged the division with having driven up the body count by killing civilians with helicopter gunships and artillery, was also largely ignored. Then, in May 1970, the Concerned Sergeant’s ten-page letter arrived in Westmoreland’s office, charging that he had “information about things as bad as My Lay” and laying out, in detail, the human cost of Operation Speedy Express. Sir, the 9th Division did nothing to prevent the killing, and by pushing the body the count so hard, we were “told” to kill many times more Vietnamese than at My Lay, and very few per cents of them did we know were enemy…. In case you don’t think I mean lots of Vietnamese got killed this way, I can give you some idea how many. A batalion would kill maybe 15 to 20 a day. With 4 batalions in the Brigade that would be maybe 40 to 50 a day or 1200 to 1500 a month, easy. (One batalion claimed almost 1000 body counts one month!) If I am only 10% right, and believe me its lots more, then I am trying to tell you about 120-150 murders, or a My Lay each month for over a year…. In this letter, and two more sent the following year to other high-ranking generals, the sergeant reported that artilery, airstrikes and helicopter gunships had wreaked havoc on populated areas. All it would take, he said, were a few shots from a village or a nearby tree line and troops would “always call for artilery or gunships or airstrikes.” “Lots of times,” he wrote, “it would get called for even if we didn’t get shot at. And then when [we would] get in the village there would be women and kids crying and sometimes hurt or dead.” The attacks were excused, he said, because the areas were deemed free-fire zones. During Ewell’s time commanding the Ninth Division, from February 1968 to April 1969, his units achieved remarkably high kill ratios. While the historical US average was ten to one, Ewell’s troops reportedly achieved seventy-six to one in March 1969. Ewell’s obsession with body count was enthusiastically shared by his deputy, then Col. Ira “Jim” Hunt, who served as a brigade commander in the Ninth Division and as Ewell’s chief of staff. In a 2006 interview I conducted with Deborah Nelson, then a reporter for the Los Angeles Times, Ira Hunt claimed that the Ninth Division did not fire artillery near villages. He also denied any knowledge of the Concerned Sergeant’s allegations and argued against the notion that a command emphasis on body count led to the mass killing of civilians. “No one’s going to say that innocent civilians aren’t killed in wartime, but we try to keep it down to the absolute minimum,” he said. “The civilian deaths are anathema, but we did our best to protect civilians. I find it unbelievable that people would go out and shoot innocent civilians just to increase a body count.” But interviews with several participants in Speedy Express, together with public testimony and published accounts, strongly confirm the allegations in the sergeant’s letters. Maj. Edwin Deagle served in the division from July 1968 until June 1969, first as an aide to Ewell and Hunt and then as executive officer (XO) of the division’s 2/60th Infantry during Speedy Express. In September he spoke to me about “the tremendous amount of pressure that Ewell put on all of the combat unit operations, including artillery, which tended to create circumstances under which the number of civilian casualties would rise.” Concerned specifically that pressure on artillery units had eroded most safeguards on firing near villages, he confronted his commander. “We’ll end up killing a lot of civilians,” he told Ewell. Another American to witness the carnage was John Paul Vann, a retired Army lieutenant colonel who became the chief of US pacification efforts in the Mekong Delta in February 1969. He flew along on some of the Ninth Division’s night-time helicopter operations. According to notes from an unpublished 1975 interview with New York Times Vietnam War correspondent Neil Sheehan, Vann’s deputy, Col. David Farnham, said Vann found that troops used early night-vision devices to target any and all people, homes or water buffalo they spotted. No attempt was made to determine whether the people were civilians or enemies, and a large number of noncombatants were killed or wounded as a result. It is common knowledge that an officer’s career can be made or destroyed in Vietnam…. Under such circumstances–and especially if such incentives as stand-downs, R&R [rest and relaxation] allocations, and decorations are tied to body count figures–the pressure to kill indiscriminately, or at least report every Vietnamese casualty as an enemy casualty, would seem to be practically irresistible. News of the atrocities in the Delta was already leaking into public view. That winter, veterans of Speedy Express spoke out about the killing of civilians at the National Veterans’ Inquiry in Washington, and the Winter Soldier Investigation in Detroit. In April 1971, at hearings chaired by Representative Ronald Dellums, Vietnam veteran West Point graduates testified to Ewell’s “body count mania.” That same month, Record’s Washington Monthly piece appeared. The lack of public exposure allowed the military to paper over the allegations. In August 1971, well over a year after the sergeant’s first letter to Westmoreland, an Army memo noted that the Criminal Investigation Division was finally attempting to identify and locate the letter writer–not to investigate his claims but “to prevent his complaints [from] reaching Mr. Dellums.” In September Westmoreland’s office directed CID to identify the Concerned Sergeant and to “assure him the Army is beginning investigation of his allegations”; within days, CID reported that the division had “tentatively identified” him and would seek an interview. But on the same day as that CID report, a Westmoreland aide wrote a memo stating that the general had sought the advice of Thaddeus Beal, an Army under secretary and civilian lawyer, who counseled that since the Concerned Sergeant’s letters were written anonymously, the Army could legitimately discount them. In the memo, the aide summarized Westmoreland’s thoughts by saying, “We have done as much as we can do on this case,” and “he again reiterated he was not so sure we should send anything out to the field on this matter of general war crimes allegations.” Shortly thereafter, at a late September meeting between CID officials and top Army personnel, the investigation that had barely been launched was officially killed. In 1971, something caught the eye of Alex Shimkin, a Newsweek stringer fluent in Vietnamese, as he pored over documents issued by the US Military Assistance Command, Vietnam, or MACV, which coordinated all US military activities in South Vietnam: the radically skewed ratio of enemy dead to weapons captured during Speedy Express. At the urging of Kevin Buckley, Newsweek‘s Saigon bureau chief, and with no knowledge of the Concerned Sergeant’s allegations, Shimkin began an exhaustive analysis of MACV documents that offered dates, locations and detailed statistics. From there, he and Buckley began to dig. They interviewed US civilian and military officials at all levels, combed through civilian hospital records and traveled into areas of the Delta hardest hit by Speedy Express to talk to Vietnamese survivors. What they learned–much of it documented in unpublished interviews and notes that I recently obtained from Buckley–echoed exactly what the Concerned Sergeant confided to Westmoreland and the other top generals. Their sources all assured them there was no shortage of arms among the enemy to account for the gross kills-to-weapons disparity. The only explanation for the ratio, they discovered, was that a great many of the dead were civilians. Huge numbers of airstrikes had decimated the countryside. Withering artillery and mortar barrages were carried out around the clock. Many, if not most, kills were logged by helicopters and occurred at night. “The horror was worse than My Lai,” one American official familiar with the Ninth Infantry Division’s operations in the Delta told Buckley. “But with the 9th, the civilian casualties came in dribbles and were pieced out over a long time. And most of them were inflicted from the air and at night. Also, they were sanctioned by the command’s insistence on high body counts.” Another quantified the matter, stating that as many as 5,000 of those killed during the operation were civilians. In November 1971 Buckley sent a letter to MACV that echoed the Concerned Sergeant’s claims of mass carnage during Speedy Express. Citing the lopsided kills-to-weapons ratio, Buckley wrote, “Research in the area by Newsweek indicates that a considerable proportion of those people killed were non-combatant civilians.” On December 2 MACV confirmed the ratio and many of Buckley’s details: “A high percentage of casualties were inflicted at night”; “A high percentage of the casualties were inflicted by the Air Cavalry and Army Aviation [helicopter] units”; but with caveats and the insistence that MACV was unable to substantiate the “claim that a considerable proportion of the casualties were non-combatant civilians.” Instead, MACV contended that many of the dead were unarmed guerrillas. In response to Buckley’s request to interview MACV commander Creighton Abrams, MACV stated that Abrams, who had been briefed on the Concerned Sergeant’s allegations the year before, had “no additional information.” Most of Buckley’s follow-up questions, sent in December, went unanswered. In the end, Buckley and Shimkin’s nearly 5,000-word investigation, including a compelling sidebar of eyewitness testimony from Vietnamese survivors, was nixed by Newsweek‘s top editors, who expressed concern that such a piece would constitute a “gratuitous” attack on the Nixon administration [see “The Vietnam Exposé That Wasn’t,” at thenation.com, which discusses Buckley and Shimkin’s investigation of atrocities, including one by a Navy SEAL team led by future Senator Bob Kerrey]. Buckley argued in a cable that the piece was more than an atrocity exposé. “It is to say,” Buckley wrote in late January 1972, “that day in and day out that [the Ninth] Division killed non combatants with firepower that was anything but indiscriminate. The application of firepower was based on the judgment that anybody who ran was an enemy and indeed, that anyone who lived in the area could be killed.” A truncated, 1,800-word piece finally ran in June 1972, but many key facts, eyewitness interviews, even mention of Julian Ewell’s name, were left on the cutting-room floor. In its eviscerated form, the article resulted in only a ripple of interest. Ewell now lives in Virginia. During a 2006 visit I made to his home with Deborah Nelson, Ewell’s wife told us he no longer grants interviews. Ira Hunt retired from active duty in 1978 as a major general. He too lives in Virginia. George Lewis, the man tentatively identified by the Army as the Concerned Sergeant, hailed from Sharpsburg, Kentucky. He was awarded a Purple Heart as well as Army Commendation Medals with a “V” for valor for his service in Vietnam and was formally discharged in 1974. Lewis died in 2004, at age 56, before I was able to locate him.